No doubt Senator Eugene McCarthy was an unabashed liberal on many issues. Colunmnist Charles Krauthammer's Weekly Standard essay on the moral defensibility of torture in fighting terror has raised eyebrows, and the New York Times tries to gin up more controversy in a feature on Krauthammer for the Sunday Week in Review. On MSNBC's Hardball Friday night, four weeks to the day after he devoted his show to trying to convince viewers that the Bush administration tried to make the American public believe Iraq was involved in the 9/11 attacks to sell the Iraq War (see earlier Newsbusters posting for details), Matthews again pushed this myth, claiming that "many, many times" between the 9/11 attacks and the Iraq invasion, "the case was made that we were going after them, the people that had attacked us. While conservative talk radio blazed this week over DNC chair Howard Dean's comments on Iraq, that the idea we're going to win is "wrong," an important question arises: did the average American who does NOT listen to talk radio, but relies on network morning or evening news, hear the same uproar? Are the aware of the brouhaha? Don't bet on it. A quick search of the name "Howard Dean" in Nexis from Sunday to Friday showed no Dean mention on ABC. None on CBS. Andrea Mitchell Says Kerry was "Lied To, Misled"
While appearing on MSNBC's Hardball on Friday December 9, NBC News correspondent Andrea Mitchell, reacting to a clip of John Kerry saying he would not vote to authorize the Iraq War if he had it to do again because, in his words, he was "misled about the intelligence," Mitchell responded by claiming, "It's true they were lied to, misled, however you want to characterize it." On Friday, talks ended in Canada in regard to the United Nations Framework Convention on Climate Change in rock-star fashion as former U.S. President Bill Clinton hit the podium--unofficially. "The US military is not good at nation-building. President Bush said, when he ran the first time, We're not going to get into nation-building." Source: No transcript is yet available, but this was TiVo'ed and the quote is accurate. MATTHEWS: Did you—when you look back on the Vietnam War, if you remember—they used to have votes all the time in the U.S. Senate and the U.S.
A front page New York Times story on the global warming talks in Montreal chose to place all the blame for America’s refusal to move forward with the highly controversial Kyoto Protocol on the Bush administration. In doing so, the Times didn’t inform its readers about the history of this accord, and, in particular, that the Senate in July 1997 voted 95-0 against it. E! Online (via Yahoo) reports that the upcoming second season of ABC's "Dancing With the Stars" will feature "original 'Access Hollywood' host" Giselle Fernandez, better known inside the MRC as a former CBS News and NBC News reporter. (She's not the only journalist tapping toes: ESPN anchor Kenny Mayne is also in the cast.) The story features the TV writer's academic omnipresence, professor of pop culture Robert J. 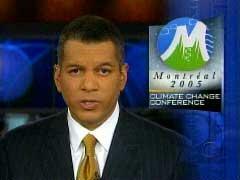 On Friday night's CBS Evening News, substitute anchor Russ Mitchell read a short item relaying Bill Clinton's criticism of President Bush, with Clinton calling him "flat wrong" for opposing the Kyoto treaty in a speech at the UN conference on climate change in Montreal.